Newton Aycliffe-based shower designer and manufacturer Roman has received The Queens Award for Enterprise for International Trade. Roman has been awarded the recognition for International Trade as it has shown a substantial and sustained increase in export earnings over three consecutive 12 month periods, to a level which is outstanding. The Queens Award is made on the advice of the Prime Minister after examination of applications by an Advisory Committee composed of leading individuals from industry, commerce, trade unions and government. The awards are conferred by her Majesty the Queen on her birthday on April 21. As part of The Queens Award, Roman will be invited by The Queen to attend a winners celebratory ceremony held at Buckingham Palace. There will also be a ceremony held at Roman Headquarters where a presentation will be made by The Queen’s representative, the Lord Lieutenant of County Durham. 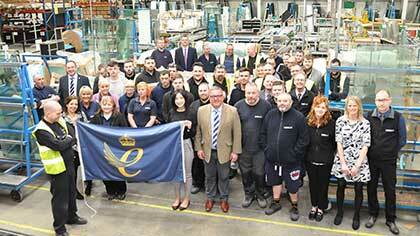 Phil Wilson MP said: “Roman winning the Queen’s Award is brilliant news for the business and the people who work there. “The award is also excellent news for Newton Aycliffe, County Durham and the North East of England. Roman design and manufacture shower enclosures and solid surface products for the bathroom at its headquarters on Aycliffe Business Park. The firm has three manufacturing plants – one for shower enclosures, bath screens and wetrooms, and another for solid surface fabrication of vanity units, basins and bathroom structures, and the third for moulding solid surface shower trays. Roman has achieved such a strong position in the market place by consistent and creative product innovation and has produced significant growth across all UK market sectors and in the past five years, while it has established subsidiaries in Ireland and Malaysia. The Aycliffe manufacturer is currently active in 28 international markets and has supplied products for projects in over 50 markets across the world from County Durham. Roman managing director David Osborne added: “Our sustained investment, patience and belief over the last 10 years in developing our international markets has proved a great success and for this to be recognised in such a way is a very proud achievement. • Newton Aycliffe manufacturer Roman is among an impressive list of Europe’s top 1,000 fastest growing companies. The leading shower designer and manufacturer, based on Aycliffe Business Park, has made the FT1000 list, compiled by the Financial Times. There was in-depth research carried out to find the 1,000 fastest growing companies. This research included not only public calls for participation but also intensive database research as well as direct contacts with tens of thousands of companies. Many months were spent finding the outstanding companies among the millions of existing European enterprises. The entire FT1000 ranking is featured in a Special Report of the Financial Times, published on April 24. Roman managing director David Osborne (pictured above) said: “We are truly proud to be one of the FT1000 businesses and to be named one of the fastest growing companies in Europe – what an achievement. “We have seen Roman go from strength to strength and there has been significant growth of the past five years.